A nervy, low-scoring encounter in first India Vs West Indies T20 match International between India and West Indies saw the hosts scrape out a five-wicket win courtesy of an anchor innings by Dinesh Karthik. Restricting West Indies to a well below par 109-8 in their 20 overs, India limped their way to 110-5 to take an all-important 1-0 lead in the series. 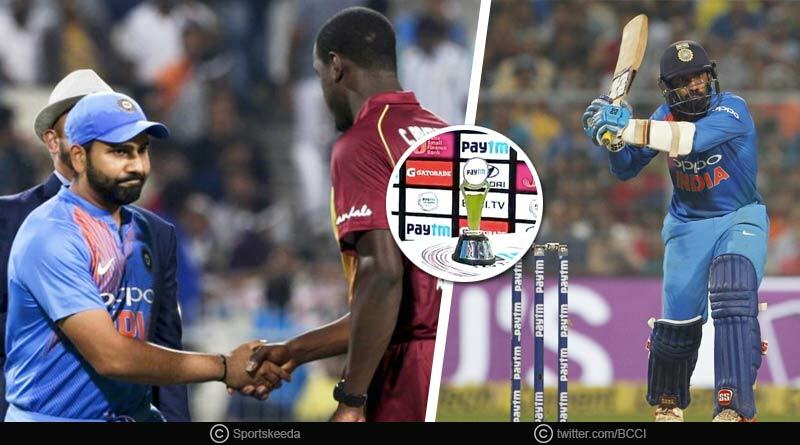 After the highly successful test and ODI series which India had clinched in their favour by a margin of 2-0 and 3-1, the two sides squared off for the final challenge that awaited them this season. With the likes of Kieron Pollard, Darren Bravo and Dinesh Ramdin back in the West Indies line-up, the visitors were expected to launch a much stiffer challenge for India come the first T20. However, their performance turned out to be a real damper, putting in another shambolic batting performance yet again. Batting first, West Indies faced their biggest setback and perhaps what turned out to be the turning point for them in the face of a messy run out involving Shai Hope and Shimron Hetmyer. Having to depart after losing his wicket in the mix-up, Hope’s departure for West Indies meant them losing their most in-form batsman this tour, something they could never recover from. An all-round bowling display by the hosts saw them pick up wickets at regular intervals to stifle any chance of West Indies getting a proper partnership. Reeling at 70-7 at one point, a late surge by Fabian Allen saw West Indies scrape through past the 100 run mark, a total that the Indians were expected to come and chase with ease. Refusing to go down without a fight, West Indies struck early, having India on the mat at 45-4. The total was too small to make a meal out of for the visitors though with Dinesh Karthik holding the fort to guide India to a comfortable win in the end, much easier than the scoreboard read. Rohit Sharma: Felt it was an exceptional performance with the ball. There was quite a bit for the fast bowlers upfront and even for the spinners, I thought we used the conditions well but were in trouble chasing. We knew it won’t be easy given the seamers they have, but there’s something to learn for us there about what we should do as a batting unit when conditions are in our favour. Carlos Brathwaite: Don’t think we applied ourselves. We were either too defensive or too attacking. We could’ve scored at least 130-140, which would’ve been a winning total, had we kept some wickets for the back end. As a young bunch of guys, we want to play fearless cricket. We had our chance to do something for West Indies, we have a task to get to the standards where we should be. For more details on India Vs West Indies T20 match and related updates, like and subscribe to tentaran.com. For more updates, do Subscribe to our newsletter and follow us on Facebook, Twitter , and Google+.